By Yotam Ottolenghi and Sami Tamimi. Ten Speed Press: 2012.
by Einat Admony. Artisan: 2013. 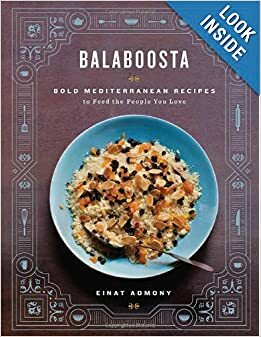 So I thought it might be fun to look at this trend by comparing two cookbooks – Jerusalem and Balaboosta (also the names of their authors’ respective restaurants). 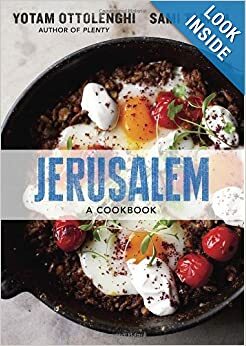 The Jerusalem cookbook, by Ottolenghi and Tamimmi, is so so trendy, there was even an entire New York Times dining section devoted solely to readers’ favorite Jerusalem recipes. Why so trendy? Theories abound. People want to be involved in their food preparation again. Maybe they can’t resist the kumbaya of Ottolenghi, a Jew, and Tamimmi, a Palestinian. Maybe their cute accents are irresistible. Brace for impact?? But the one positive takeaway she will attribute to her mother (you have to turn the page and keep reading to find it, though) is that her mother was a balaboosta and passed this on to Admony. Herein lies is, for me, one of the great unsolved mysteries of Admony’s work: why use such a Yiddish word if all the cuisine is going to be decidedly Mediterranean/Sephardic? I haven’t seen many reviews or articles that, when discussing this Israeli food trend, really address the kashrut issue. Both O&T and Admony ignore it. Neither discusses the particulars of how to make a dish kosher and while neither goes so far as to succumb to the bacon-fat-everywhere trend, they do both offer a number of shellfish recipes. And Admony’s challah recipe calls for milk? I guess this works better if you’re having a Shabbes fish rather than chicken soups. With O&T I shrugged and moved on, perhaps also because Tamimmi’s presence indicated more Arabic-style food and I don’t know all the rules for that. But it’s particularly strange in Admony’s book, since in her introduction she indicates (though not explicitly) that she grew up in a very kosher home: her memories are about Friday afternoon busyness and she recalls how they “scoured lettuce for microscopic worms.” I think that all three authors do a disservice with this, as they freely acknowledge that their cuisine is highly influence by Jewish culture and history. And Admony especially, with her intriguing nuggets regarding her feelings on religion – such as in her notes for the challah, which she says is “maybe not the way God intended it, but I’m sure She understands.” I for one would love to hear more on her thoughts about religion if that’s what she thinks when braiding her challah. Other reviewers have acknowledged that a hallmark of middle eastern cuisine, whether traditional or nouveau, is the use of many, many different herbs and spices for each recipe. It’s what makes the recipes taste new and different – all the various combinations – but it is, everyone admits, labor intensive, and you have to have a large spice cabinet. I thought I would do a hummus comparison of their recipes, but it turns out that Admony and O&T’s recipes for this are pretty similar. Significantly, I thought, both recommend the use of a little baking soda when simmering your chickpeas, and both are heavier on the tahini and much lighter on the olive oil than I had seen in various other recipes. I have been bringing this recipe books to the class that I teach at the Hebrew High on Jewish cooking, and enjoy hearing the students’ squeals when I invite them to find the strangest or most unexpected recipe (Admony often wins with her oxtail soup recipe, but really any old picture of a whole fish can send the kids into apoplexy). I like the general idea of promoting Israeli culture in the great world, so that people see Israel’s vibrant culture and understand it as a place that is more than just endless conflict and territorial wars. 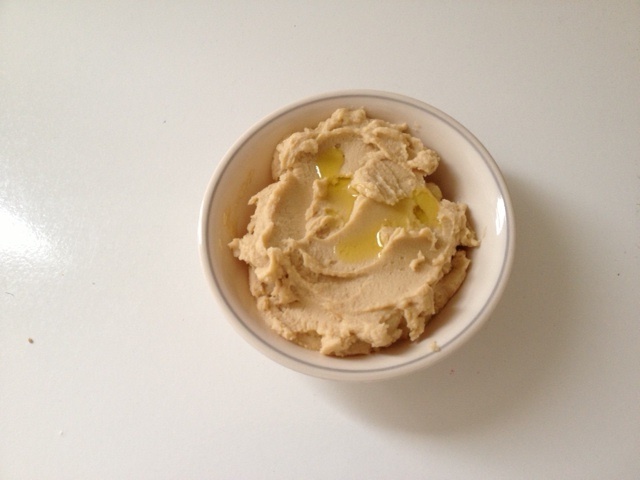 After all, we are all hummus-sapiens and nothing brings us together like foods.